The moon hung so huge in the icy June sky that it seemed all out of proportion with the stars. Fat and full, a deep mature-cheddar-yellow and so low in the sky, it was as if I would be able to touch it once I reached the crest of the hill. I was driving six hours to Durban on the second stage of Children of Fires raison dêtre: After Dorah. The quest is to find an effective way to help other children injured like Dorah Mokoena  those already hurt and those who, inevitably, will be hurt in the future. To be proactive and tackle education of the least educated  in fire-and-injury-prevention, in first aid and childcare, in understanding the need for swift medical treatment if a child is burned and knowing how and where to get it. Longer-term aims are to help parents and the children themselves, to understand the medical process of fixing limbs and faces, and how they have a right to aim for the best available treatment. How they can fundraise for sums that state health care cannot meet and where the best possible and affordable treatment can be found. 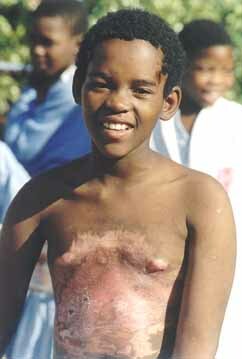 Children of Fire is aware how few dedicated burns or childrens medical facilities there are in South Africa. There is only one dedicated childrens hospital in Africa south of Cairo and that Red Cross Childrens Hospital in Cape Town needs 36 million rands just to function, now. 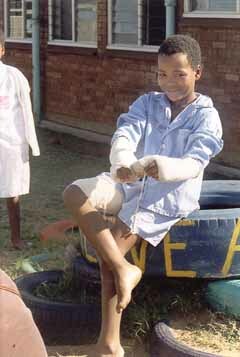 Even if children get the optimum treatment when they are injured, those from rural areas in particular are lost to medical follow-up, because there is no way of keeping in touch with the families, let alone provision for transport costs or a field worker who will take the time to explain the need for follow-up to the families. The task is enormous and the full extent of the problem is not known. Industrial theatre, television and video can provide a short-term increase in awareness; radio too reaches into the poorest households. Often poor families have a television operating from a car battery even if there are no other "mod cons" around. But print media where at least one person in the household can actually read has to be the best choice because people can look at it more than once. They can discuss the pictures and information in their own time. The journey to Durban was to meet a British dietician Luise Marino who is working for a pittance as a normal South Africa state healthcare employee, trying to improve the diet of Durbanites and deal with a whole host of related socio-economic and political issues across KwaZulu Natal. She decides how to nurture the manifold malnourished children but she also deals with aspects such as giving people with extensive burns the best possible food to help them rebuild skin quickly. Luise is personally involved in the welfare of a little girl who lost much of her face and hands when a petrol bomb was thrown through the house window in the township where the then two year old was staying. Casey, as she is known, got the best treatment available and very quickly. Now she is a precocious, friendly, almost-five year old. Caseys proper name is Kimberleys Charlene Mattheys. She lives with her diminutive 14-year-old sister Cenovia and her 40-year-old mother Ethel. The father Jan Johannes Mattheys, also 40, lives somewhere in Cape Town and provides no financial or emotional support for his former family at all. So I drove to Durban aware only of a tiny proportion of the problems that I would find there. Maybe the only benefit of a long drive - once the children had fallen asleep in the back  is the time to reflect. But the trip from the cold highveld plateau on which Johannesburg lies, right down to the warm seaside city of Durban is tough in one stretch. One travels from two thousand metres above sea level right down to the sea. The road companions are heavily laden lorries setting off for the port. The route has stacks of serpentine downward bends etched only in amber, green, red or white cats eyes. The lorries travel too fast and accidents are not unusual. It was still daylight as I crossed the boring dusty plains of the Free State with occasional stark monoliths of rock introducing the edge of the Drakensberg. But night falls quickly in this southern hemisphere winter and dusk was too short to remember. I prayed that the car would not let me down as I found a couple of hundred kilometres with no garage at all and tried not to imagine what it would be like if we broke down. Women and children are quite seriously at risk if they are stranded at the roadside at night in South Africa. The car worked well. It is underpowered as a difficult-to-replace heat control switch is missed out by a piece a makeshift copper wiring. But it has four wheels and goes. Thats all I really needed. My well-meaning navigator seemed unable to tell right from left but eventually we arrived at our destination: Wentworth Hospital. Tedious security men delayed our entry but soon we were ensconced in Luises tiny flatlet. Luise is a remarkably tall red head of part-Italian extraction but who speaks only English. We had supper of a tasty curry but I was really too sleepy to savour it well; collected some cushions from a communal sitting room and made makeshift beds on the floor. I slept between 7 year old Tristan and 8 year old Thobeka while my other companion, 23 year old American volunteer Amy had her own berth. We rose around 6.30 the next morning, fed the little ones Fruit Loops and set off to meet a leading plastic surgeon in the area. The hospital where we went to meet Dr Madaree was stunning. I was mentally revising all my thoughts of KwaZulu-Natal provincial health care when I realised that it was private. Ah well. I thought, some love it, some hate it. I dont mind generating good publicity for him if he helps the children that I want to help. Madarees specialty is not particularly burns but he has worked with a lot of burn victims. He talked of Fluffy who was severely damaged but whom everyone describes as beautiful now. She apparently has false hair stitched to her scalp that prettily frames her face. She and a boy called, I think, George Ogle, both attended a special school in the area called St Raphaels. It is the same school that Casey attends and seems recommended by all who know of it. Luise said that Madaree had managed to reattach the legs of a boy that were severed by a combine harvester and that he is recognised as a superb surgeon. He expressed shock that anyone would think to remove Dorahs eyes; and then started to say how he would work with her if she were his patient. Hes keen on placing "cushions" or bags beneath the skin that are inflated with air or saline and stretch areas of useful skin. Particularly where a patient has lost a lot of hair-growing skin on the scalp. He says by stretching a good area, one can move the surplus skin forward (once it has been created) and so make the hairline more natural again. Madaree thinks this would be a good idea for Dorah. I certainly think it is worth mentioning to her current doctors who want to improve skin quality on her forehead, as it is certainly an option to place a bag under the skin at the back of her scalp. Madaree also thinks it is important to work on the possible right hand for Dorah soon because of tightening ligaments with time. Madaree even told me that one of my UK contacts James Partridge is coming out to South Africa to give a motivational talk at a major burns conference next April. Luise suggested that I should speak at it from a laymans point of view  maybe on the morality of medicine. Madaree has agreed to draw up a summary of his view of problems in his area and of possible solutions. He has also agreed to collate details of past and future patients who form useful case histories to put Children of Fires point across  or who may need our help in future. He admitted that many patients that he helped with a great deal of surgery were lost to essential follow-up, because they returned to remote areas and there was no means (and particularly no staff) to find and remind them. He believed that some patients would have died because of this. We then went to meet Casey, the petrol bomb survivor. Being used to Dorahs appearance, Casey is a beauty queen. But to others, they would notice her nose is tiny because it doesnt have the fatty lump at the end that most of us have; her eyelids look sore and her mouth is skew. Her teeth are normal and meet nicely at the front. She has no hands but has a useful mitten-like left arm, where a short thumb allows Casey to hold a pencil and write, or to turn pages of a book. On her right stump the knuckles of a hand are visible beneath the skin and reconstruction for some dexterity will be attempted later. The skin on the "hand" areas is of a very odd snakeskin-like texture. When Casey takes off her hat, the front half of her head is bald and made of fragile thin whitish skin with scabs in places because it breaks so easily. The hair at the back of her head grows normally and is tied with bright yellow ribbons. And her ears look fine though Luise says part of the earlobe is missing. But Casey was older than Dorah when she was burned. So she had learned and developed more. Now she is one of the brightest in her class and has a personality to match. She happily sits on the laps of strangers and is quite conversational. We met her with Marissa  a senior caterer at the hospital who helps a number of children in her personal capacity. And she helped Caseys mother to get a job and a large room for the family of three, so that Casey had a more secure future. We went to Wentworth Hospital to meet her mother. A tiny woman with a very pretty face and a sharp sense of humour. I thought of Dorah and Margaret and wondered if the mothers always seemed beautiful in comparison with their children  but realised in both cases that the two mothers simply happen to be good looking and that they form a reflection of how their children might have been. Then off to a ward where 11 year old Lungile Shange from Driefontein Tongaat had a rectangular little headpad beneath the skin on her forehead. The objective? To stretch the skin and allow movement of hair-producing areas to the totally bald triangle one side of her skull, where hair and skin had been scraped off in a car accident. It was her birthday but no one in the ward seemed aware of the fact. And then to Clairwood, a few kilometres away. Thokazani Hlatshwayo has an irrepressible spirit. 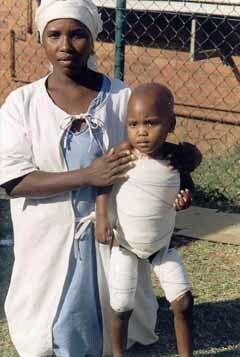 A dashing ten year old secure in self worth and his own charms, he is heavily bandaged on both arms. His right thigh is bound, not because of burns but because surgeons have borrowed the skin from there to try to rebuild his damaged hands and arms. But how was the boy from Bergville burned? By dropping his single one rand coin into the fire by mistake and thinking that he had to save his paltry wealth at once, in case it melted. Thokazani could not explain this to me in English; but a bilingual mother of another burns victim translated my persistent questions and his answers. Thokazani is a handsome boy who will overcome whatever long term damage he has suffered. For now he simply doesnt know the extent of it, but hops around, the life and soul of the ward. Quiet Lungile Ncobo is also ten years old. She speaks English well and explains that she was pumping paraffin out of its container and that there was a lit candle nearby. "It just exploded onto me" she says. From her pubescent breasts down to her waist, Lungiles brown skin is instead several shades of sore red and pink, scabby where it is too thin. And yet she smiles. At least today her grandmother is coming to fetch her home to Mayvill. I ask Lungile what "treatment" she was given before going to hospital. She says the family broke eggs over her stomach. I assume that this is ineffective but check with a nurse before condemning it  and she reassures me that this is an old wives tale and simply a waste of food that others certainly need. Lungile has to return to Kind Edwards Hospital for further treatment. I hope she does. Kethiwe Hlongwane is four. Like Thokazani she too is from Bergville near the Drakensberg mountains. Her face, lips, arm and scalp are freckled and blotched in white. No one can readily tell me the details of how she was injured but Kethiwes insistence on wearing her own orange and white daisy covered dress rather than pastel blue hospital pyjamas shows a strong spirit in one so young. Sinovuyo Phalazweni turns four in July. Her skirt caught fire as running round an open fire, playing. Sinovuyo was left in the care of a nine year old while her mother Novumile was working the fields for the farmer. She can hardly bear to stand and does so bandy legged and in pain. She is from Lusikisiki, Goqwana location  some four hours away. The ward, in an old typhoid and other fever hospital, is painted white and has some pictures on the walls but no toys at all. There is a jungle gym outside and some of the children are fit enough to use it, but one feels that the nurses are more inclined to keep them inside. I give the children books because I did not have enough toys with me to give one to each of them. Because most children come from far away, many have no visitors. No family to see them through the painful operations and the lonely nights. I talked to the nurses and tried to encourage them a little. I showed them photos of Dorah. The children except those most recently burned were mostly in good spirits. But some round faced toddlers just sat sad and lonely and searching for a familiar face. It seemed as if the pain of feeling abandoned (even if it was simply that their parents lived far away)  or actually being abandoned - was far greater than the pain of scarred legs and bandaged heads. Luise helped feed the little ones bread in milk. It seemed an uninspiring diet to an outsider but she said that nutritionally it was ok (though not brilliant). Then off to the coast for coffee, waves, shark warnings and conversation. The elegant street lamps were strung with notices  no dogs, no bicycles, no swimming, ..the city of nos. We took Marissa home and I bought a couple of enormous pizzas to share. Tristan and I eat out so rarely I was shocked at the price  but they tasted good! And then we started to talk some ideas through. What was needed and what to do. to inspire those who are injured about the hope after treatment and to inspire others to contribute funds. And I felt like asking for the name and number of the large white nurse who steals valium and other drugs from the hospital  en route to the patients - and sways around outside the hospital and in the childrens ward in a drunken manner. Or the name of one of only two social workers at Wentworth who does so little (apart from her home handicrafts) that doctors are unaware that there are two social workers on the payroll. Or the name of the alcoholic housekeeper who instead of being sacked was promoted. On Sunday we talked more and then tried to arrange a meeting with a translating contact who also lives in Durban  but could never get beyond her home help who demonstrated her inability to understand English by simply putting the phone down  again and again. So I took the children to the beach and for a coastal cable car ride  so that they had a little rest and relaxation on an emotional trip. They ran in and out of the waves for an hour or more before we made contact with Patience Buthelezi, the translator, teacher and collector of Zulu rhymes, and went to see her briefly at her home. I showed her and her husband a series of Dorah photos .. and tried to enlist her rather reserved husband into assistance with getting Children of Fire discussed on Radio Zulu (for who he works). And then the long schlep back to Joburg. The bends were easier to negotiate in daylight. And then we drove into the most stunning sunset of scarlet, turquoise, salmon and charcoal with strips of buttercup-almost-gold yellow. The panorama of mountains and sky stretched almost 360 degrees as we drove, seemingly, ever up towards and into the firmament. Quickly it was night. Pitch black and then red clouds glowed from behind the silhouette of the mountains. We were driving into a massive veld fire that ringed the rocks and pinnacles all around. The lines of scarlet flame like red thorns encircling us; the smell of smoke heavy in the air. This was the biggest known fire to hit Harrismith. An amazing spectacle; like a scene from Dantes great poem sprung to reality in the hills of KwaZulu Natal. And so we drove through, safely. To plan the next stages of Children of Fire. Bronwen Jones, Johannesburg, RSA, June 1998.